Many pundits are forecasting the demise of big box retailers, including troubled Best Buy. Sales are down. The stock has been pummeled. Now the company has brought in a new CEO with a new 5-step plan to turn things around. Let’s take a closer look at his strategy. The first step in the “Renew Blue” plan is to offer shoppers special benefits and exclusive membership programs. Best Buy already does this and it’s not working particularly well. It’s hard to imagine what special benefits Best Buy can offer that will truly stand out from the competition. It’s hard to imagine their Reward Zone plan rivaling Amazon’s Prime program. 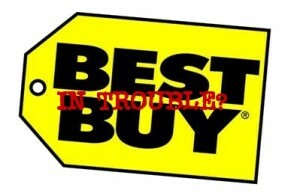 Additionally, Best Buy will try to be more “helpful” to customers. This means no selling and more “service.” I went into a Best Buy the other day and saw this new plan in action. I was asked if I needed help no less than 5 times in a few minutes. “Just checking out TV’s,” I said. By the fifth helpful person, I was annoyed. Best Buy needs to realize that the internet has fundamentally changed the way people shop. Anything resembling sales, including “can I help you,” feels like sales. Sell is now a four-letter word. Best Buy can say they are not selling me, but why do they keep hounding me offering to help? Because they want me to buy something, and that feels a lot like selling to me. Huh? Ok, hire great people and have them lead us through the wilderness. Got it. Every corporation in the world wants to do this. It’s not even a new priority at Best Buy. “The company plans to introduce a new store labor model to be implemented in all of its U.S. big box stores before the 2012 holiday season that will provide increased store employee training and a new enhanced compensation plan that introduces financial incentives for delivering on customer service and business goals,” read a press release in March. This one has some promise depending how Best Buy plays it. Best Buy is still the largest electronics retailer in the U.S. and can leverage that with vendors. Creating one-of-a-kind products, available only at Best Buy, is an idea on the right track. However, if Best Buy is simply looking to work with vendors to drive down costs, forget it. Best Buy will not be able to compete with Amazon’s pricing structure and will need to find other ways to beat them. A recent study conducted by KeyBanc Capital Markets showed that Amazon’s prices were 8% lower than Best Buy’s even without the sales tax advantage. This includes cutting “unproductive” costs, such as administrative and non-product expenses. Best Buy is aiming for a return on invested capital of 13 percent to 15 percent, in addition to a 5 percent to 6 percent adjusted operating margin target vs. 4.7% today. This percentage has been declining, not rising. It’s going to take more than wishing it higher to drive better results. The best way to accomplish this may be moving to smaller stores the way it has been doing with its tiny Best Buy Mobile stores. If it wasn’t for RadioShack, this might make sense. Unfortunately, going heavy into mobile has been a train wreck for RadioShack. It’s hard to see how a similar strategy will work for Best Buy. I’m all for cleaning up the planet, but I don’t see how recycling batteries gets someone to pay $50 extra for a television. Teenagers can already sell their used phones and iPods online for cash. The other half of the market doesn’t care about recycling. Worst of all, there’s only a temporary need for recycling of CDs, DVDs, books and video games as these products move to digital delivery. This strategy seems to be nothing more than corporate speak and PR nonsense. Conspicuously absent from Best Buy’s plan of attack is what they plan to do about showrooming. As long as Best Buy pays for Amazon’s showroom space, their business model is a mess. To me, Best Buy should take the lead on combating the showrooming issue while they still have clout with vendors. Get rid of appliances. Big boxes rule because they offer exceptional selection over smaller stores. Best Buy needs to focus on “wowing” customers with the offerings they have and get out of weaker areas. Lowes and Home Depot offer 3-4 times the number of appliance SKUs. I don’t even consider shopping for an appliance at Best Buy, and I bet I’m not the only one. Lean on vendors for exclusivity, even if it’s only a token. Sony Television Model # FVG554 is $445 at Best Buy and $423 at Amazon. It’s not a tough choice. If I’m not in a hurry, I buy from Amazon. Best Buy needs to offer 27 or 28 inch TVs vs. 26 inches or 45 inches vs. 42 inches. Anything that makes it more difficult for customers to compare apples to apples. People want to buy things today. They don’t want to wait for it to ship. This can serve Best Buy. However, people don’t want to overpay. It’s an obsession. Take away the ability to compare and consumers won’t feel like they overpaid. Consider blocking cell service. I realize this is radical, but if the showrooming doesn’t stop, it’s over. The issue isn’t whether blocking cell phone service in the store will annoy customers, it’s will it stop them from shopping. Get exclusives on hot new products. Imagine if Best Buy would have secured an exclusive on Beats headphones when the company was desperate for distribution. Take Geek Squad up a notch. The perception of the talent level of the Geek Squad is that of your tech savvy neighbor. He can fix that virus or stubborn issue you can’t quite seem to get. However, the Geek Squad kid isn’t perceived to be talented enough to fix a business computer network. How about Geek Squad Elite? Get some $100,000 a year, highly talented technicians to work on the more complex and higher ticket jobs in addition to the current $20/hour a little better-than-you-are techs. Go member’s only. Customers are obsessed with great deals. Give them great deals, if they are members with different levels, e.g., $25/year for price level 1 and $50/year for even better prices at level 2. Costco has proven that you don’t need to make much margin on the merchandise if you can sell enough memberships. Instead of going to smaller stores, go big. Cut the number of total stores by two thirds, but double the square footage of the remaining stores. Turn these mega stores into the holy grail of electronics. These mega stores would act like a magnet to shoppers. Make up for the lost sales from closed locations with online pricing that rivals Amazon’s. What do you think Best Buy should do to revive profits?